Coca Cola has become the first company in Africa to obtain internationally recognised Leadership in Energy and Environmental Design (LEED) Gold and Silver certification at its Valpré Water Bottling facility in Heidelberg, Gauteng. Developed by the United States Green Building Council, LEED is an internationally recognised green building organisation that provides building owners and operators with a framework for identifying and implementing practical and measurable green building design, construction, operations and maintenance solutions. The build-up to this unprecedented success started in 2007, when SMEC South Africa was appointed as the principal consultant and project manager. SMEC South Africa technical director Gert Wentzel points out that the site selection was done after extensive geo-hydraulic studies. Following this, SMEC South Africa was responsible for appointing a professional team that consisted of an architect, a quantity surveyor and a team of engineers specialising in areas of expertise that includes: civils, geotechnical, traffic, structures, mechanical, electrical and fire. During the course of 2008, the SMEC South Africa team undertook specialist geotechnical and traffic impact investigations before construction work began in 2009. “One of the unique innovations of the project design was to ensure that the facility blended in with the surrounding landscape. The roof sheeting colours were selected to have the highest possible SRI (solar reflectivity index). The aggregate for the concrete was also selected for its high refection value resulting in reduced heat gain in the building and minimizing the heat island effect,” explains Wentzel. "The facility is located outside the urban footprint since it has to be close to the source; this, according to natural bottled water legislation. All the water used for the product and for domestic consumption is sourced from within the catchment area surrounding the facility. The fresh water management system is a closed system and all water used on site is treated and re-used. What’s more, all effluent that is generated on site is treated and re-used for service water purposes. In combination with the harvested rainwater, a sufficient amount of service water is generated to minimise extraction from the local resources," says Wentzel. Wentzel points out that in order to reduce electricity consumption, the facility was designed to enable the maximum amount of natural sunlight to enter the building through the roof. A daylight study revealed that a castellated roof with both transparent and translucent sheeting was the best option for filtering natural light onto the floor space. The design and placement of electric lights internally and externally was done in an environmentally responsible manner, creating a comfortable working environment. 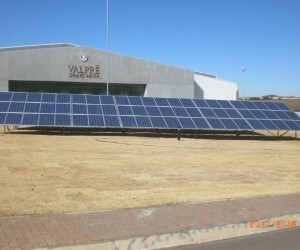 Valpré plant manager Refentse Puso points out that the design has proven to be such a success that the main production floor now requires minimal electric lighting. "This substantial reduction in electricity consumption has been further complimented by the use of the solar power plant and motion and daylight sensors. The solar power plant has been sized to generate enough power to fulfil the administration offices’ needs, which practically makes the office block a net-zero building." Puso continues, “With the establishment of the new Heidelberg plant, SMEC South Africa has assisted Valpré in ensuring that it will reduce its carbon footprint, lower its water usage ratio, adopt energy efficient lighting and production technologies, and boost it solid waste recovery”. The solid waste recovery area consists of sorting and packaging equipment that sorts waste at the source. The recovered waste items are paper, plastics, metal and organic material. The sorted waste is then collected by approved recycling companies for further processing. Wentzel has only praise for the first class professional team involved in this project, from Casper Durand of Coca Cola South Africa for being a visionary client, to all the SMEC staff who played their part. Also of note was Peter Opthoff from the contractor WBHO, Luis Prazeres of PPS Architects, LEED consultant Mike Barker of Building Physics, quantity surveyor Anthon Botha from Pentad , fire engineer Leon Potgeiter from IFESA and Patrick Kohler, mechanical engineer from Spoormaker . Looking to the future, Wentzel believes that an increasing number of operations in South Africa will be aiming for LEED certification, as a result of increased awareness through public and legislative pressure to embrace sustainable development principles. "As local businesses continue to set higher sustainability targets, I am confident that SMEC South Africa has placed itself in a strong position to be selected as a professional services provider for future ventures, after successfully assisting Coca Cola in becoming the first company in Africa to achieve LEED Gold and Silver certification," he concludes. LEED projects have been successfully established in 135 countries. LEED-certified buildings are designed to lower operating costs and increase asset value, reduce waste sent to landfills, conserve energy and water and reduce harmful greenhouse gas emissions, in addition to being healthier and safer for occupants.